Description: This is the fifth incarnation of Gratitude, which began as a seasonal release designed to thank Hoyne’s patrons for their support. And in the keeping with the tradition of Winter Warmers, this years offering is extra strong ale that is dark, malty, has a nice spicy flavor. Tasting Notes: Well now, this is my fifth sampling of this beer over the years and I swear that it has been changing with time. Always, I have noted that the Gratitude Winter Warmer captures all the notes of a good winter ale without being overwhelming. But this year’s offering does seem more flavorful than previous ones. The hints of brown sugar and dark fruits are not just hints, and the notes of allspice are there in full. And all the while, the alcoholic strength manages to warm the insides without overwhelming the palate. In the course of my beer sampling, I rarely get farther south than the great state of Oregon. However, once in awhile I am afforded the opportunity to sample from as far south as California, the Golden Coast and beyond. And I am rarely disappointed or left feeling less rich for the experience. Tonight was one such time. In my neck of the woods, the Lost Coast lineup has been making the rounds and I find myself wanting to include them in my repertoire. 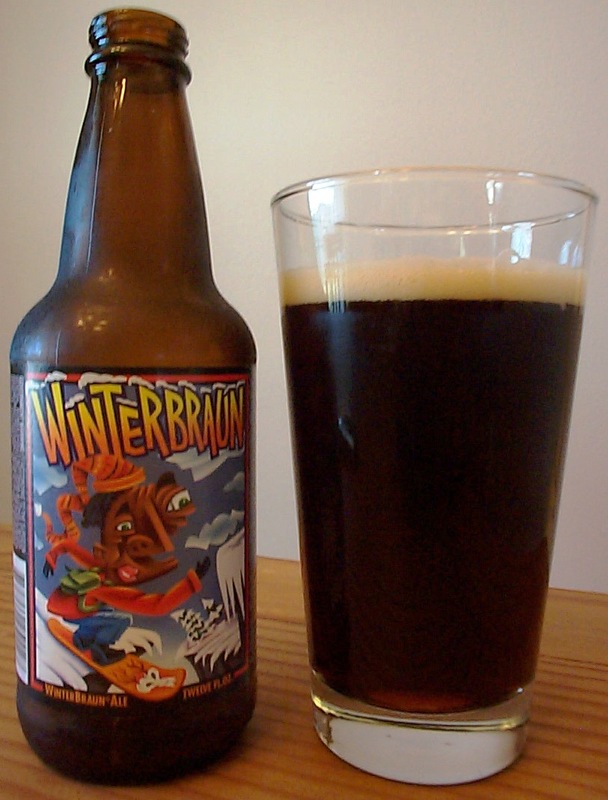 And since I’ve been determined to sample as many winter beers, this one seemed perfectly appropriate. And it was certainly no slouch when it came to delivering in both the flavor or balance of flavors department. Combining a brown ale with the stronger character of a winter beer (8% alc/vol) and roast chocolate, Lost Coast created something that warmed my ribs and tickled my fancy! One of the nicest things about this winter beer was the fact that the chocolate comes through in a subtler tones, rather than being heavily overt. What’s more, the dark brown profile and rich, sugary flavor are very appealing and combine with with the beer’s decidedly strong alcohol content. I’ve already earmarked some of their regular fruit-infused beers for consumption, and will be back with some of those just as soon as the right kind of weather rolls around. Somehow, it’s just got to be warm and sunny in order for fruit beer to be appropriate… Wait for it! It seems just about everybody in Victoria was getting on the “wet-hopped” thing this past summer. 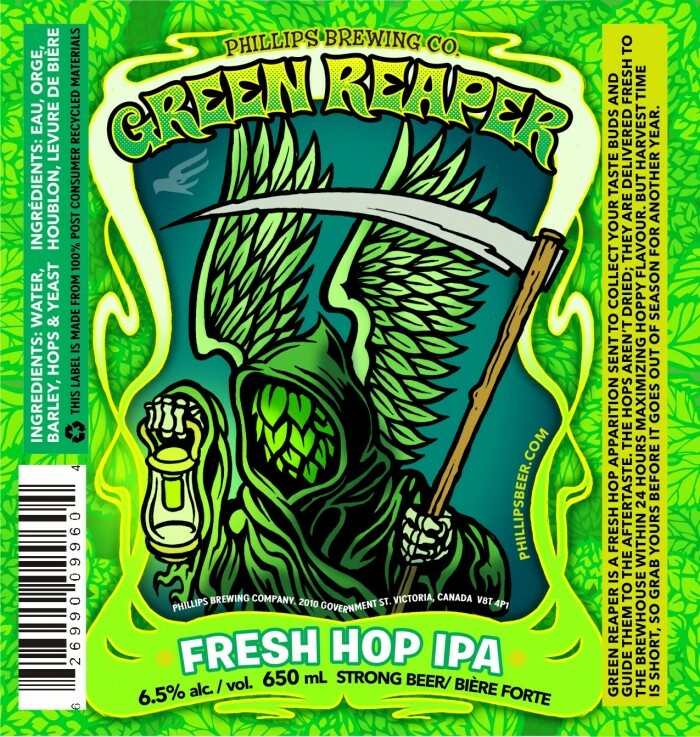 First there was Hoyne’s Wolf Vine Pale Ale, then Driftwood’s Sartori Harvest IPA, and now Philips Green Reaper. What do these three venerable breweries and these most recent products have in common? They are all fresh-hopped (aka. wet hopped), meaning they use hops that are local and fresh off the vine rather than of the usual, dried variety. However, whereas the previous two beers used Sartori hops fresh from Vancouver, Philips uses Willamette hops were harvested from Nanaimo, mere hours before they were added to this latest limited release. Though I came to it late this past summer, I am happy to add it to my review lineup now. You may notice the word “light” being featured here a few times. Well, there’s a reason for that. As is the case with all fresh-hopped beers that I have now sampled, the flavors are quite subtle and smooth. There is of course the usual combination of citrus and grassy bitterness, but they come across as more subdued and layered. As we are now coming into winter, I have to admit that I will miss this variety of beer which I am quite new to. However, I’m quite sure the winter seasonals will keep me entertained until next summer!